will be mentioned in a moment....lol suspense. Well it has happened. You all hit 10,010 to be exact by the time I caught the count and by Saturday morning too. Country Stitcher(Denise)is the winner. I've sent you an email to get your snail mail addy. Thank you all for being regular visitors. I appreciate so much your support and encouragement of me in this craft that we all soooo love. Whew....all done with shades of gray/black. 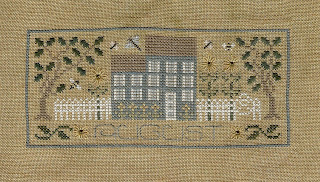 This was a fun stitch though and to step back every once in a while & squint to see the picture develop. I also notice I am 38 visits away from 10,000. I will have a giveaway...not sure just yet what it will be...will stash supply dive in a bit....from now till I hit 10,000 visits(or I see that I hit 10,000) anyone who comments & asks to be entered will have a chance for my secret(at the moment) prize. I retraced my steps a bit and went back and did Drawn Thread's August calendar cover after having skipped it to do September. I used a piece of scrap hand-dyed fabric for this and love the way it softens the blue and blends well with the sunflowers. 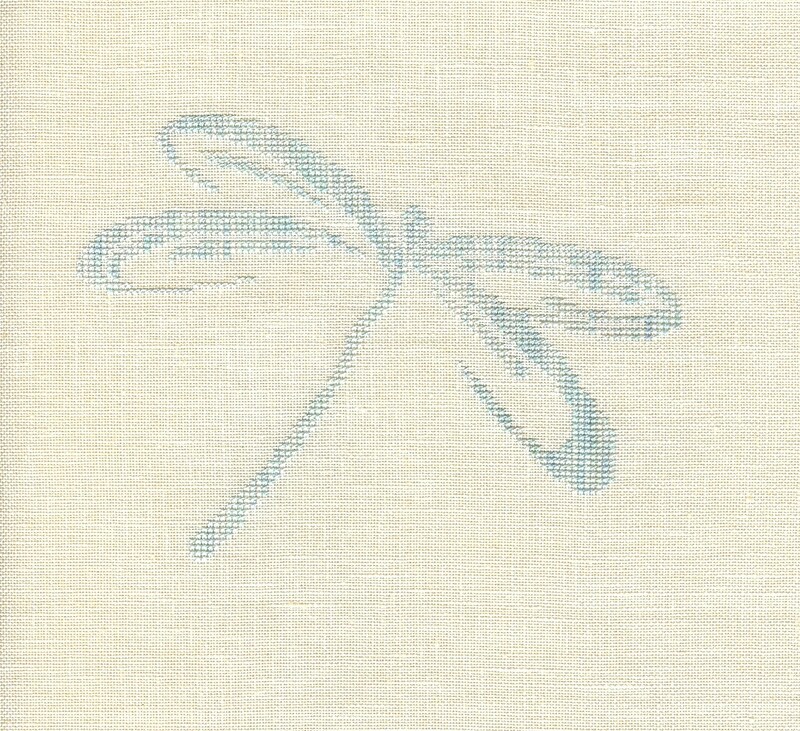 FYI for those doing these, the chart cover shows the dragonfly as yellow, but the chart has it charted as the blue. 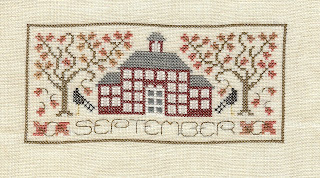 Now I am stitching on part 3 of the mystery sampler and should have it done this week. series is over 1/2 way done. I jumped out of turn and did September first and now am working on August. About comments....I don't know why some of you can't leave comments. I have it set to anyone to comment, I do have it set to moderate though so I don't get the solicitations & invitations from strangers. 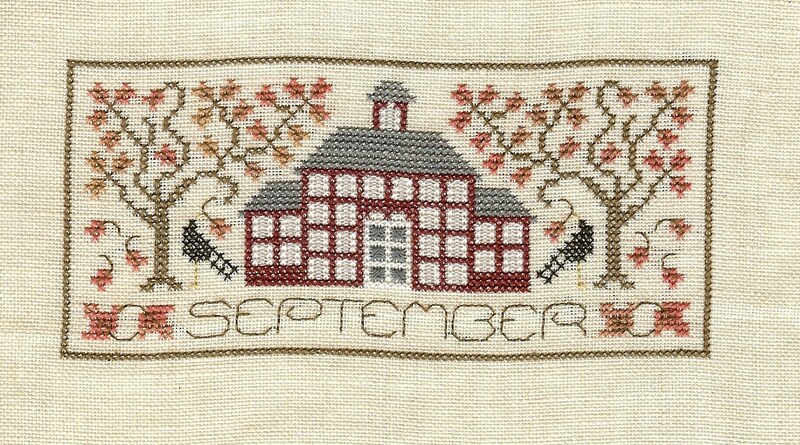 This is from this year's Ornament preview issue-JCS June/July. The design is from Ink Circles. Since I'm waiting on part 3 of the mystery sampler, I decided to pull out this quick Halloween design. 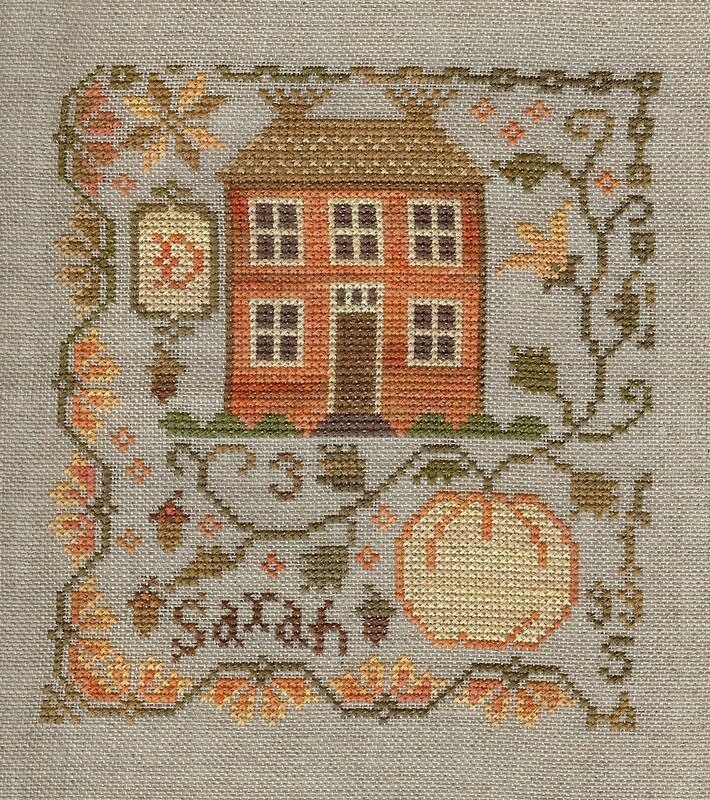 It's a fun stitch with lots of fun colors. Here is Drawn Thread's Almost Halloween. 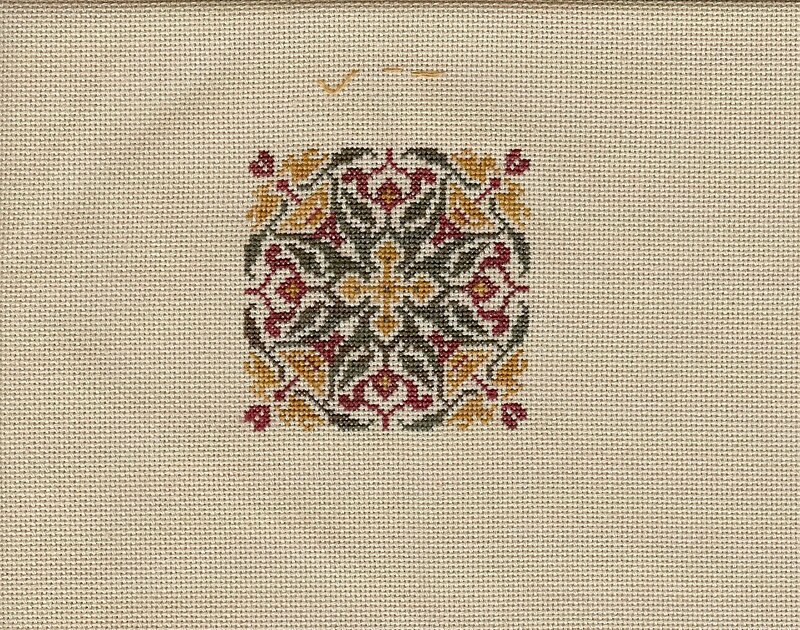 This is my wip of With thy needle & thread BOAF mystery. 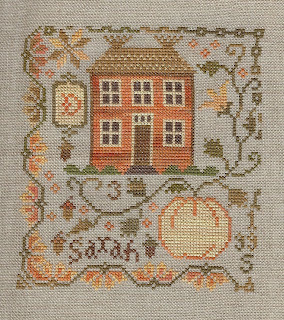 I'm just a few dozen stitches short of being finished with parts 1 & 2. The two gifts have been delivered so I can show my finishing on these two Bent creek Wedding Row finishes. 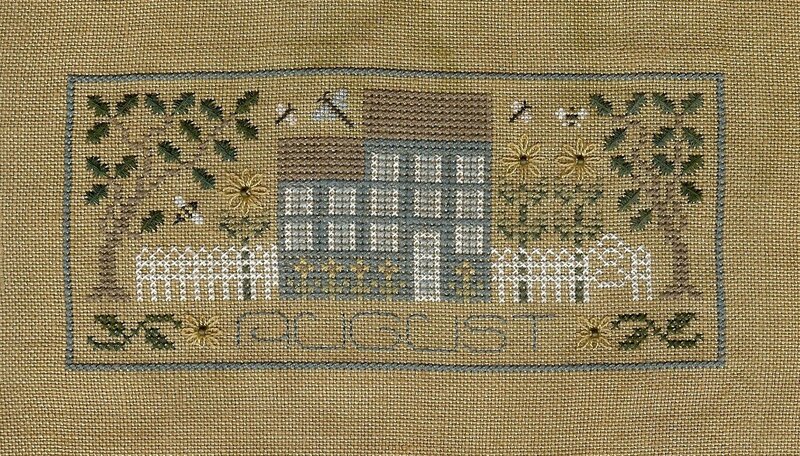 Now that the 13 year cicadas have gone and we are awaiting the yearly ones to pop in, and also fighting off the Japanese beetles I thought I would stitch a pleasant bug. 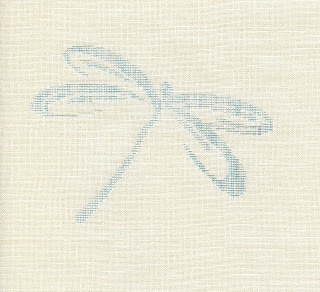 Here is Alessandra Adelaide's libellula(dragongfly). 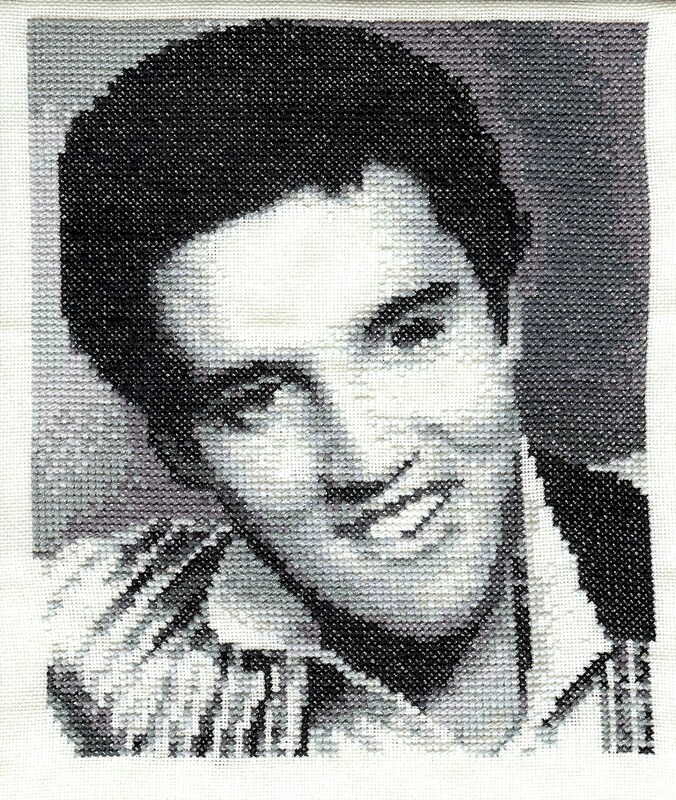 It's a bit pale on the scan, but I stitched it on cream 36 ct. with Seafoam HDF. I'm selling this chart for $3 + postage. This is Pumpkin Farm, much more vivid colors than the picture on the leaflet. 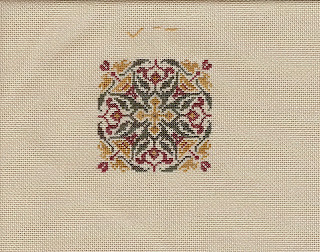 I think I like the muted colors better but it will stay....will always from now on do a floss toss of called for colors for their designs....this is at least the 2nd time it doesn't look as nice as portrayed. Oh well, live and learn. I may also frog the year and rearrange the layout for it. Looked great with 2004 that way but not 1995.